The Student Research Assistant will assist in the NUS‒NParks Marine Debris Project, which involves establishing a national baseline data of marine debris. The role involves mainly assistance in the processing of microplastic samples and possibly in marine debris monitoring programme, and volunteer management. The position is part-time with hourly wages. Sorting and identifying of microplastics from sediments. Assisting in marine debris field surveys at coastal areas. Compiling existing data from International Coastal Cleanup Singapore and data management. Must be a current undergraduate in a local university. At least A’level / Diploma knowledge in Biology. Meticulous and responsible with samples and data management. Strong oral, communication, and interpersonal skills. Self-motivated and able to work independently. Training will be provided but some experience in sorting (e.g., macroinvertebrate sorting) would be useful. Some knowledge and experience in marine debris. Experience in data and volunteer management. To apply, please send a cover letter and CV to Ms Joleen Chan at joleen.chan@nus.edu.sg by 13 July 2018. Shortlisted applicants will be notified for the interview by mid–July 2018. The event is an informal discussion about research in NUS that might be useful for students thinking ahead toward internship, UROPS, FYP, or graduate studies. Three graduate students, representing research labs in Environmental Biology & Biomedical Sciences will share their research experiences. Do indicate your interest so that we know how many students to expect – tinyurl.com/chalk2017. If you have any other queries, feel free to email Jerome Kok (jeromekok@u.nus.edu). Despite the increasing environmental pressures on coral reef ecosystems, many are still thriving as they exhibit acclimatization mechanisms as response to a suite of co-occurring and temporally variable environmental stimuli. Genomic approaches have provided tools for coral reef studies to aid in understanding ecological responses to changes in the surrounding environment through information on the transcripts that are regulated across different environmental conditions. The transcriptome-wide responses of hard corals to environmental factors have been described for only a few species. To understand how communities are likely to cope with the rapidly changing climate, it is imperative to determine the underlying acclimatization mechanisms for a range of coral species at different levels of variation. My PhD thesis project aims to assess the relative contributions of host and algal symbionts in facilitating survival under varying environmental conditions, using conventional methods in assessing the physiological state of corals in conjunction with genomic approaches for inferring genetic mechanisms of acclimatization. Life Sciences graduating students – you are invited to a Farewell Dinner, Fri 08 Apr 2016: 6.00pm – register now! “If you are completing the undergraduate course and graduating at the end of this semester, an early congratulation to you for the achievement made! The Department of Biological Sciences would like to invite you to a farewell evening event! To register for the event, please go to http://tinyurl.com/DBSgraduatefarewell2016. Are you ready for the semester? Your TAs are! LSM1103 Biodiversity TAs, honours year and graduate students, at the end of the Kent Ridge recce today, in preparation of the field trips which begin in Week 1. Boy, do they so they look ready for the semester! 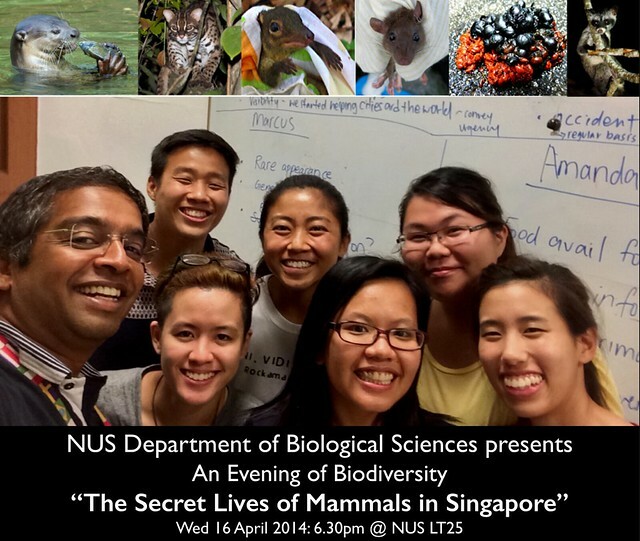 I am glad to announce “An Evening of Biodiversity: The Secret Lives of Mammals in Singapore” presented by six young graduates of the Department of Biological Sciences, National University of Singapore. They share with us short stories about wild mammals from their recent student research and their hopes for Singapore’s wildlife and heritage. Come and be surprised by the stories about Singapore’s wild leopard cats, small mammals, smooth-coated otters and the common palm civet. The graduates, Amanda Tan, Chloe Tan, Marcus Chua, Meryl Theng, Fung Tze Kwan & Xu Weiting do this as part of a desire to contribute to public awareness and the protection of our fragile ecosystems. And they look forward to entertaining the audience! We do look forward to your company. Do RSVP if you are able to join us and feel free to forward this invitation to family, friends and colleagues. Small mammals have rarely been studied in Singapore and after over a decade Amanda Tan conducted a study of the diversity and abundance of small mammals around the Eco-Link. Once again the value of our unique, precious and fragile Bukit Timah Nature Reserve was demonstrated and the importance of the new forest connection with the Central Catchment realised. Chloe Tan took small mammal exploration island-wide for the first time, documenting diversity in nine sites of varying forest quality. Eight species and three habitats later, she realised we cannot be hasty about connecting all our green areas – what were her concerns? Sometimes we conduct surveys just for completeness. But on April Fool’s Day no less, the eyes of a leopard cat gleamed at Marcus Chua from amidst the undergrowth. After more than four decades, three populations provide relief about the longevity of this rare species but new issues emerge for our attention. The smooth-coated otter (“anjing ayer”) returned to Singapore in 1998 exactly as predicted – Sungei Buloh Wetlands Reserve, where these fish-eaters enjoyed prawns too! In the northeast, otters spread from Pulau Ubin through Punggol and eventually south to Marina Bay! Meryl Theng tracked the otters, not only by foot but through the enthusiastic and generous submissions of Singaporeans delighted at the return of this wild carnivore. The common palm civet is a wild carnivore nestled in our backyard but surprisingly poorly understood. At Pulau Ubin, poop-specialist Fung Tze Kwan was surprised to discover that civets favoured the fruits of the common fish-tail palm and improved the growth of its seedlings! When adopted as the logo of the Raffles Museum, the toddycat was entwined with a palm leaf – little did we realise this poorly studied pair was linked in an ecological partnership which may prove to be relevant in habitat restoration in the future. As wildlife spreads in this garden city, they feel the pinch of space too. As Xu Weiting studied wildlife-human interactions, orphan civets needed care and the protocols which arose went online and helped civets elsewhere in Southeast Asia too! This furry animal is not always greeted with delight, sometime conflict arises. Awareness of these neighbourhood acrobats has helped to transform fear to delight and a hope in the hearts of young researchers of a future of greater co-existence. Job opportunity: Help us out at the Comprehensive Marine Biodiversity Survey! 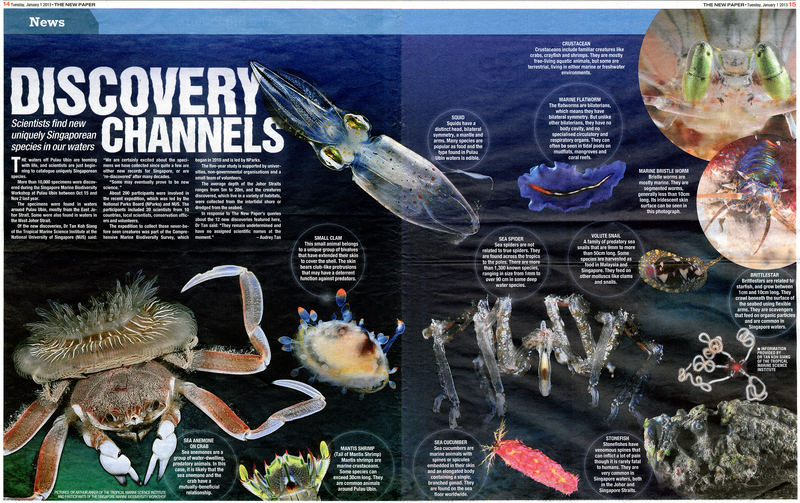 The Comprehensive Marine Biodiversity Survey (CMBS), is a national project that takes stock of Singapore’s marine ecosystem and species diversity, species distribution and abundance. It began in 2010 and will conclude in 2015. Besides regular surveys, the project includes two intensive 3-week expeditions in which local and international researchers come together to study the various marine taxa found in our waters. The first expedition surveying the northern shores (Johor Straits) was held in October 2012 and we are now gearing up for an encore in May, this time in the southern waters of Singapore. TMSI is recruiting four student assistants to help out during the Comprehensive Marine Biodiversity Survey workshop. If you have a passion for biodiversity research, fieldwork, or just want to learn and interact with local and international marine scientists, this is a golden opportunity to garner the necessary experience. The successful candidate will be involved in various aspects of the expedition, such as logistics, equipment cleaning and maintenance, field collection, dredging, sorting, preservation, photo taking, data entry and assisting researchers. Be able to stay in expedition base camp (at St John’s Island) for the duration of the expedition (20 May to 8 June). Enthusiastic and able to work well with others.No prior experience necessary, but that will be a bonus! Please contact Joelle Lai, Raffles Museum of Biodiversity Research at dbslcyj[@]nus.edu.sg if interested.